Aside from feeling UHHH-MAZING, there are dozens of benefits from massage therapy. According to this Mayo Clinic article, massage can help with problems ranging from anxiety, headaches, digestive disorders and nerve pain. This Huffington Post article explains how massage therapy can also help with insomnia, PMS and depression. Other benefits? Alertness, immunity and energy boosts, increased blood circulation and emotional balance. But dropping big bucks to have a pro work out your knots can take away from the relaxation you seek. Although I've had many professional massages, being soothed by a stranger can be awkward. After reading The Massage Book (and paying careful attention during professional sessions), we decided to try our own hands at massage work. Now, if you're gonna do this right, you can't give a decent massage on a bed or couch. You need a firm surface to keep the body in alignment. 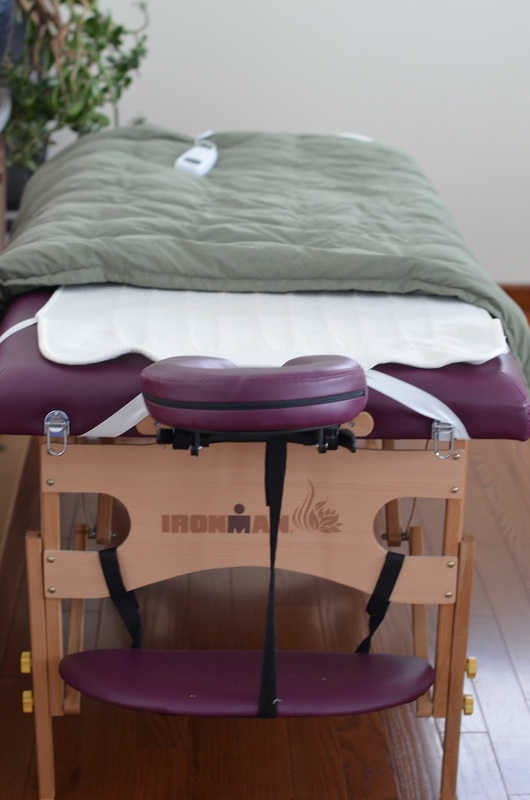 Last summer, my husband surprised me with this Ironman massage table, an incredibly beneficial addition in our home. Everyone needs one. Very reasonably priced, sturdy, and delivered right to your door through Amazon, the table folds up easily when not in use and comes with a heated cover (with remote) and both a cushioned head and arm rest. Well worth the cost. 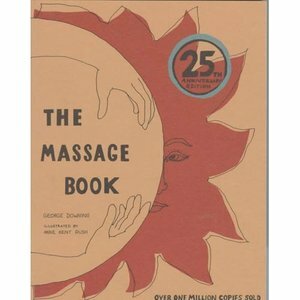 Obviously, you should study up on good massage technique (check out links here, here, and here) and then get to it! How to set the scene? Try the "Music for Brainwave Massage" channel on Pandora for super relaxing tunes. Dim the lights. Light some candles if you wish. Toss a soft sheet on top of your heating pad/table and add a warm blanket for the top cover and then go! Don't have any massage oil? No problem. 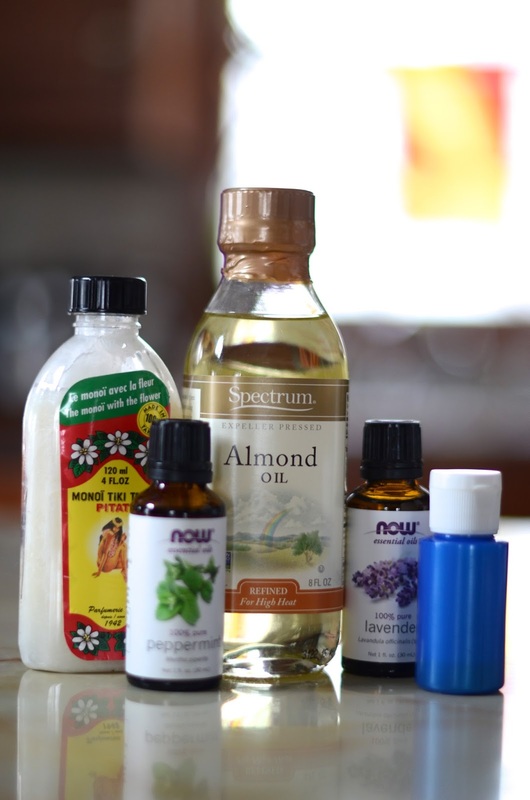 We use almond oil as a base and add a couple drops of essential oils for an aromatherapy kick. Check out this source for more info on making your own concoctions. After professional aromatherapy massages, the therapist sends me home with remaining oil in a tiny bottle— which I've saved to use for our own massage oil mixtures. The squirt-cap makes it easy to dispense oil into the hands while you're at work. Check these out if you want to buy your own. Worried it will take up too much space? Told ya'—it folds right up for easy storage. Feel weird having someone touch you? Learn to relax and let go. Here's a great way to build trust and intimacy at your own pace and in the comfort of your own home. You'll find that giving a massage is just as rewarding as receiving, so take turns! *Plus, it's incredibly beneficial to have someone who really knows your body—to help recognize any changes over time. Make massage a regular part of your routine. You and your partner will learn new techniques to strengthen your bond and working together, you'll create healthy, positive memories and experiences. What's your favorite massage technique? I love the hot stones. I've gotta try that at home. Get a table. And use it. Often.